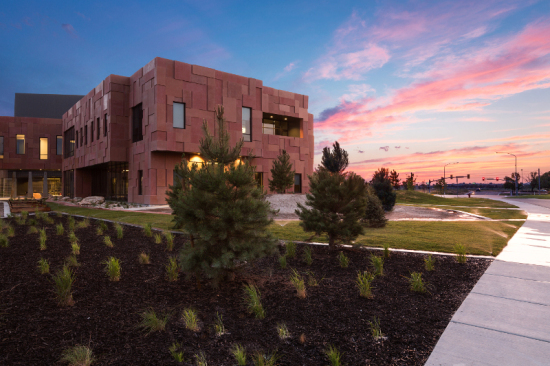 Earth-toned GFRC panels and contrasting metal wrap Petzl’s new North American hub. When Petzl executives decided to move the climbing and caving equipment company’s North American headquarters from Clearfield to West Valley City, Utah, they sought an opportunity not just to expand, but to design a facility that would reflect the brand’s mission. “The two words we kept hearing from them were verticality and light,” recalled ajc architects founding principal Jill A. Jones. “The types of products they design really have to deal with the vertical world.” Working with a southwestern palette inspired by Petzl corporation founder and president Paul Petzl’s recent visits to Mesa Verde National Park and Machu Picchu, the architects designed a combination administrative, training, and distribution center whose mesa-like bottom stories and punctuating tower appear as if carved out of desert rock. Given Paul Petzl’s interest in the continent’s arid landscapes, natural stone cladding would have seemed an obvious choice. But “to use stone would have been terribly expensive,” said Jones—especially given the building’s size, 80,000 gross square feet. “Getting a lot of stone in those larger panels would have been cost-prohibitive.” Instead, the architects looked to GFRC, and worked with Tuscan Stoneworx‘s Dave Nicholson to develop a hybrid system of stone-backed GFRC panels. Rather than being hung on the building, the panels are adhered directly to it, thus avoiding any breaks in the thermal barrier. To perfect the look of the GFRC, the architects did no less than a dozen color studies before selecting three red-orange tones for application. The panels were sandblasted on site to render the color and texture more naturalistic. Nicholson helped ajc customize every aspect of the panel system, from color and texture to corner installation. “I don’t know if he’ll ever do that again,” remarked Jones. The designers clad the tower and a bump-out over the front door in dark grey metal from Drexel Metals. “The tower itself was a sensitive area, because Petzl did something similar in their home headquarters in Crolles, France,” said Jones. “It kind of felt dark and cold; we wanted to bring a lot of daylight into the space.” The architects performed a series of daylighting studies, “to make sure we had daylighting opportunities in every occupied space.” This led to the installation of high-performance glass on both sides of the office block to avoid glare. For the warehouse area, ajc chose tilt-up concrete. But as with the GFRC, achieving a natural look took some ingenuity. “We wanted not to paint the concrete, to get a more organic look,” said Jones. “But staining the concrete was a challenge, because the form liners leave a natural coating on the panels.” Contractor Sahara experimented with various solutions once the panels were in place to find a stain that the concrete would accept. 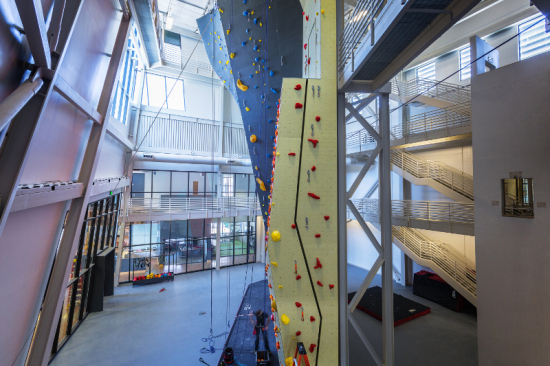 Petzl’s new North American headquarters is a fitting base camp for a company committed to pushing the limits of human exploration. Both inside and out—from its window-lit multi-story indoor climbing and training wall to its human-made, red-rock-inspired envelope—the building embodies a balance between reverence for the natural world, and celebration of the technology that makes that world a little more knowable.